Multiple lines of evidence incorporating 40 years of observations that six massive glaciers in the Amundsen Sea sector "have passed the point of no return", a worrisome sign for melting of the West Antarctic Ice Sheet. Those glaciers already contribute to sea level rise, releasing as much ice into the ocean each year as the entire Greenland Ice Sheet does. They contain enough ice to boost the global sea level by 4 feet (1.2 meters) and are melting faster than most scientists had expected. Rignot said the findings will require that current predictions of sea level rise be revised upward. 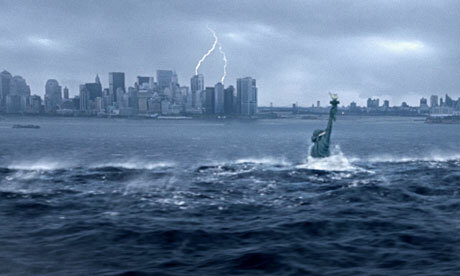 Is it The Day After Tomorrow imagery that environmentalists and a lot of journalists like to create? If you want articles that hype this in our short-term future, read mainstream media instead of Science 2.0. In reality, science has far fewer clunky dialogues than The Day After Tomorrow. "This sector will be a major contributor to sea level rise in the decades and centuries to come," said glaciologist Eric Rignot, a UC Irvine Earth system science professor who is also with NASA's Jet Propulsion Laboratory. "A conservative estimate is that it could take several centuries for all of the ice to flow into the sea." Three major lines of evidence point to the glaciers' eventual demise, at least based on short observations: changes in their flow speeds, how much of each glacier floats on seawater, and the slope and depth below sea level of the terrain they're flowing over. In a paper published last month, the research group showed that the speed at which the glaciers are moving has accelerated steadily for four decades, increasing the amount of ice draining from them by 77 percent from 1973 to 2013. This new study focuses on the other two lines of evidence. The West Antarctic glaciers flow out from land over the ocean, with their front edges afloat. The point at which they lose contact with land is called the grounding line. Virtually all glacial melting occurs on the undersides of their floating sections – beyond the grounding line. Just as a boat that's run aground can float again if its cargo is unloaded, a glacier can float over an area where it used to be grounded if it becomes lighter, which it does by melting or by stretching out and thinning. The Antarctic glaciers studied by Rignot's group have shrunk so much that they're now floating above places where they used to sit solidly on land, which means the grounding lines are retreating inland. They're "buried under a thousand or more meters of ice, so it's incredibly challenging for a human observer on the ice sheet surface to figure out exactly where the transition is," Rignot said. "This analysis is best done via satellite techniques." The team used radar observations from the European Remote Sensing satellites (ERS-1 and ERS-2) between 1992 and 2011 to map the grounding lines' inland creep. The satellites employ a method called radar interferometry that enables scientists to measure very precisely – within a quarter of an inch – how Earth's surface is moving. Glaciers shift horizontally as they flow downstream, but their floating portions also rise and fall with changes in the tides. Rignot and his group mapped how far inland these vertical motions extend to locate the grounding lines. The accelerating flow speeds and retreating grounding lines reinforce each other in a recurring loop. As glaciers move faster, they stretch out and thin, which decreases their weight and lifts them farther off the bedrock. As the grounding line retreats and more of the glacier becomes waterborne, there's less resistance underneath, so the flow accelerates, and so on – with each action intensifying the next. Slowing or stopping these changes requires "pinning points" – bumps or hills rising from the glacier bed that snag the ice from below. To locate them, researchers produced a more accurate map of bed elevation that combines ice velocity data from ERS-1 and ERS-2 and ice thickness data from NASA's Operation IceBridge mission and other airborne campaigns. The results confirmed that just one pinning point remains upstream of the current grounding lines. Only Haynes Glacier has major bedrock obstructions upstream, but it drains a small sector and is retreating as rapidly as the other glaciers. Bed topography is another key to the fate of the ice in this basin. All the glacier beds slope deeper below sea level as they extend inland. As they retreat, they cannot escape the ocean's reach, and the relatively warm water melts them even more rapidly. "The collapse of this sector of West Antarctica appears to be unstoppable. The fact that the retreat is happening simultaneously over a large sector suggests it was triggered by a common cause, such as an increase in the amount of ocean heat beneath the floating parts of the glaciers. At this point, the end appears to be inevitable."